Even though famous as a flamboyant figure of the leader and often controversy, President of the Socialist Republic of Libya's Colonel Muammar Arab Qadzafi preacher is also a unique figure. 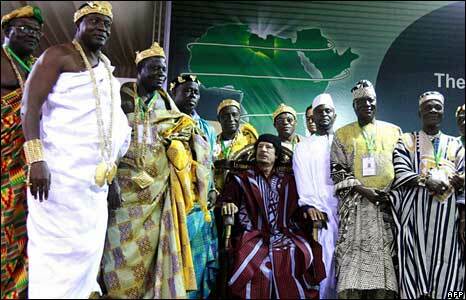 Recently, as many as ten kings and leaders of tribes across the continent of Africa declared their Islam before Qadzafi. They converted to Islam "under hand" Qadzafi. Libiya newspaper Akhbar Libya (26 / 2) launch, several kings and leaders of African countries Nigeria, Madagascar, and Ghana say the shahada in front of Islamic Demonstration dilangsungkannya Qadzafi when the V is routinely held yearly in the city of Benghazi, Libya, on Thursday (25 / 2) night. Before the kings and tribal leaders were saying two sentences creed, Qadzafi first giving lectures and Islamic discourse, such as the pillars of Iman, Islam, and Islamic teachings other noble. Qadzafi also called for, to always practice what has been ordained of God and away from all the prohibitions, to worship and righteous deeds-deeds. After giving lectures and discourses, Qadzafi also lead them to say two sentences creed, with Arabic and French, as well as lead them to read the letter Alfatihah.